Eight of the ten men charged with involvement in the brutal 2012 shooting of Pakistani Nobel Prize laureate Malala Yousafzai have been allowed to walk free. The Pakistani courtroom proceedings were secret. Despite what reporters were previously told this past April (that ten men had been convicted), Pakistani authorities secretly acquitted eight of the men charged with conspiracy and attempted murder in the case of teenager Malala Yousafzai, who was targeted because she wanted girls to receive an education. 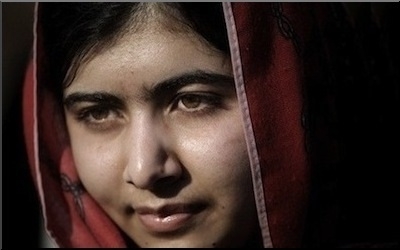 In 2012, the world was up in arms when a Pakistani Taliban gunman shot fifteen-year-old Malala Yousafzai in the head for having promoted education for girls. She survived dangerous and delicate surgery, moved to Britain with her family for reasons of security— and, along the way, received the Nobel Peace Prize, Europe's Sakharov prize for Freedom of Thought, and was named one of TIME magazines most influential people. But Pakistan—the country that sheltered Bin Laden for years—allowed the world to believe that justice was possible in this lawless country, that all the men who conspired to murder Malala and who wounded two other school girls had been convicted and sent to jail for 25 years each. Contradictory explanations for the secret military court's decision have been leaked to the media. Today, the judgment of the secret military court was revealed together with contradictory explanations. Some sources said that there had not been enough evidence to convict all ten; others claimed "misreporting" for the confusion. According to an unnamed security official, cited by The Independent and pegged to the Daily Mirror, "This was a tactic to get the media pressure away from the Malala case because the whole world wanted convictions for the crime." However, this view is upheld by the BBC's Ilyas Khan, who wrote that "even if Pakistani officials did not purposefully spread misinformation, they allowed it to stand." The Guardian quotes yet another unnamed army officer who believed that there "had been enough evidence to convict all of the men" but due to "longstanding weaknesses of Pakistan's judicial system," eight men were acquitted. This officer reported that witnesses were "intimidated into not giving evidence and the court dropped many of the charges against them." This same officer "denied claims made by the Daily Mirror that any of the men had been released. He said they were still being held and would be brought back to court." The Guardian also claims that the ten men were part of a "group tasked by Pakistani Taliban leader Mullah Fazlullah with killing a series of high-profile people, including Yousafzai." NPR's reporter, Philip Reeves, believes that it is "common for police to respond to public pressure by arresting large numbers of people who turn out to be unrelated to the crime in question, including relatives of suspects." Pakistan is a tribal, highly corrupt, increasingly violent and Islamist country, in which Christians and women are severely persecuted. Unlike neighboring India, Pakistani honor killings are usually unpunished and rarely reported. Pakistan is strategically located between India, Iran, and Afghanistan. It also happens to have nuclear power. Thus, it is America's ally. But, if you think that reporters are not on the same page about what happens in Pakistan, just imagine the thin ice upon which diplomats skate. In 2013 and again in 2015, Secretary of State John Kerry confirmed our alliance with this Wild East state. On a visit to Pakistan, Kerry announced "the reinvigoration of a Strategic Dialogue with Pakistan to foster a deeper, broader, and more comprehensive partnership and [to] facilitate concrete cooperation on core shared interests ranging from energy to counterterrorism."